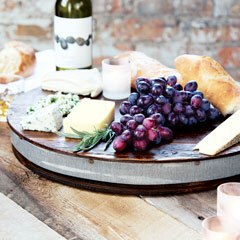 A spread of artisan cheese and a vintage bottle of wine make the most of any evening. 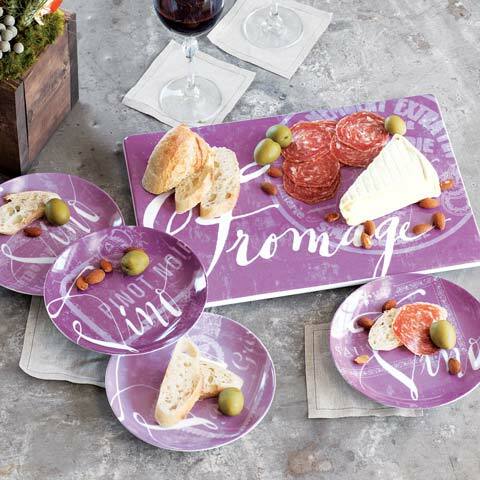 On a rich plum background, a serving tray and set of four appetizer plates embellished with the scripted words “fromage" and “vino" serve cheeses, appetizers and other small bites with European elegance. Tray measures 14 1/2" x 9 1/2" x 3/4", plates each measure 6 1/2" in diameter and set comes packaged in matching storage boxes and Olive & Cocoa® gift wrap with ribbon.